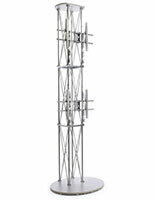 This tall TV stand towers above any other form of advertising display fixture! 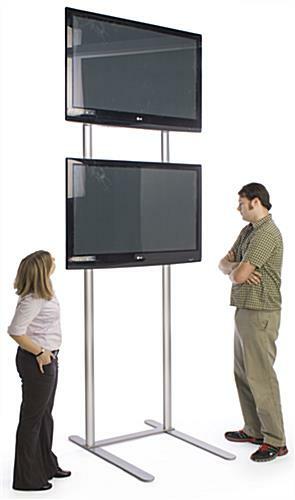 The plasma TV furniture, tall TV stand is meant for holding (2) flat panel TV monitors either vertically or horizontally in a presentational setting. 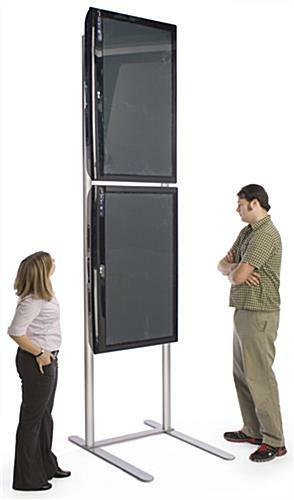 We recommend using this 10-foot tall TV stand at a trade show exhibition or retail setting as its modular design make it extremely easy to set up and transport. 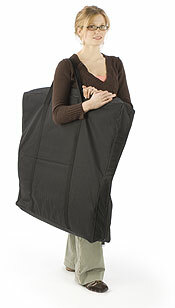 The tall TV stand, also known as a plasma TV stand or extra tall entertainment center, is even equipped with a sectioned carrying bag to enhance its portable design. This LCD mount, also known as a television rack is ideal for displaying (2) screens which gives the ability of doubling your advertising. 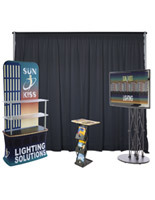 Tall TV stand can mount a 60" flat panel monitor which can be seen in many locations but is mostly used at tradeshows and events because it gives the ability of double advertisement while towering over the competition. 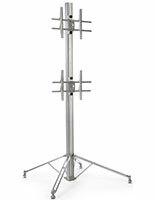 This LCD bracket is universal making it ideal for any television you may need to mount. Mounting (2) 60" flat panel to this tall TV stand makes this unit attract passersby attention as well as potential clientele. 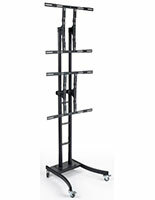 This LCD mount, television rack will go with any flat screen up to 60" as long as the weight is less than 80 lbs. 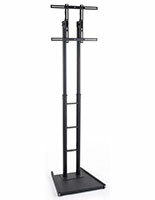 The tall TV stand is equipped with (2) television mounting brackets (compatible with 200mm x 200mm to 600mm x 400mm) to display televisions up to 60", each weighing less than 80 pounds. 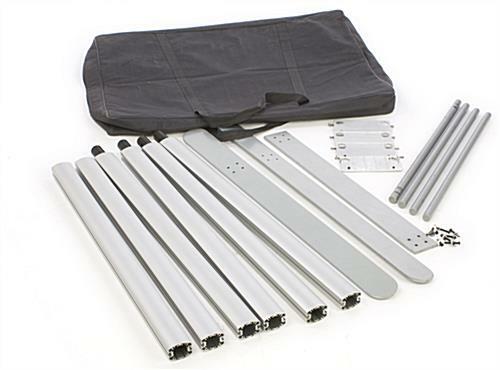 These TV mounting brackets were designed with manufacturers to fit most standard television models and sizes. 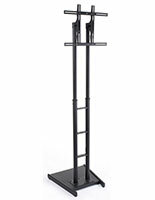 This flat panel monitor holder, tall TV stand is constructed from aluminum and features a steel base for added stability. We've provided this tall TV stand with the ability to alter the height of each mounting bracket by simply sliding its brackets up or down the side channels. Once in position, tighten your set screws with the provided Allen wrenches. These Allen wrenches are tethered to the extra tall TV stand to prevent you from losing them during travel. 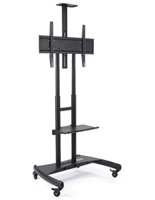 This tall TV stand, such as flat panel monitor stands, is a great tool to increase your digital advertisements and presentations' visibility. This has to be the worse experience I have had with Displays 2 Go and probably the last. 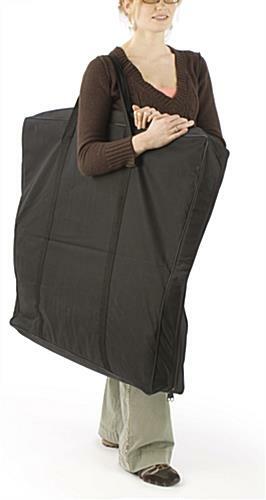 Product received without necessary. Called and rep sent out the wrong screws and when I contacted her for return authorization I never heard back. That was on April 22nd, 2016. We are very sorry that it has been so long and that you hadn't heard back from us yet, Tony. 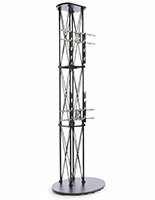 We will have a customer care representative reach out to you as soon as possible.